usconstitution.net has printed a special edition copy of The Constitution of the United States that has been proofed word for word against the original Constitution housed in the Archives in Washington, D.C. It is identical in spelling, capitalization and punctuation. 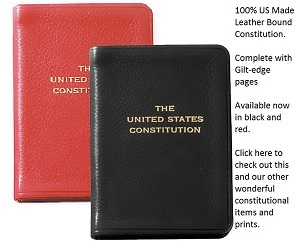 This 48 page Pocket Constitution also includes the Bill of Rights, Amendments 11-27, The Declaration of Independence, and a complete index of the Constitution. Now only 4.99 which INCLUDES shipping and handling! The following is a list of all U.S. Presidents under the Constitution. The "(i)" is a link to a picture (JPG image) of each president. Photo credits can be found on the Photo Credits Page. A table listing the election data for each presidential election is available, too. Click on any of the headings to sort by that value.